Woodbridge, United States - February 26, 2019 /MarketersMedia/ — Surviveware, a favorite brand among hiking and camping enthusiasts, continues to gain the favor and loyalty of customers around the US. The company’s line of safety and preparedness gear has become a staple on many people’s camping, hunting, and hiking trips. More and more individuals are relying on the efficiency and functionality of the company’s products, especially their bestselling first aid kits. The popularity of Surviveware’s first aid kits is evident in their growing fanbase, such as for the recently released Large First Aid Kit. Surviveware’s Large First Aid Kit contains the features that customers loved about its predecessor, the Surviveware Small First Aid Kit. The kit is made of high-quality 600D polyester fabric that keeps water and dirt away, and is malleable for squeezing into tight rucksacks or drawers. The case also helps to keep the kit buoyant which is a plus for those who store their packs on boats, canoes, or kayaks. Since the case floats on water, kit owners don’t have to worry about losing their first aid kit should it fall overboard. This expanded version holds 200 life-saving provisions, each of which are systematically stored inside a 10” x 7.25” x 5” bag. These supplies are useful in treating a wide variety of wounds, insect bites, splinters, and injuries, such as sprained ligaments. The kit holds first aid tools like medical-grade trauma shears, tweezers, safety pins, cold packs, nitrile gloves, hydrogel, fever strips, and a detachable CPR kit. Surviveware prides itself on its uniquely organized first aid kits; the supplies are stored inside compartments, according to use. Each compartment has labeled piping showing the contents and its appropriate use. This feature enables kit owners to retrieve supplies quickly, while its MOLLE-compatible strap system allows the kit to be attached to rucksacks, hydration packs, tents, and roll bars. “I purchased the Large First Aid kit as it seemed to provide the most product and quality for the price. It did not disappoint. The packaging was quality, and the kit came bagged to prevent any water damage. This proved great as the box was exposed to rain for a time my porch. It fits perfectly in the Jeep and I'll likely order one to keep in the house. It's well made with good stitching and quality materials. The kit provides room for personalized additions such as masks, wipes, glue, etc. Another reason I bought this kit over others. 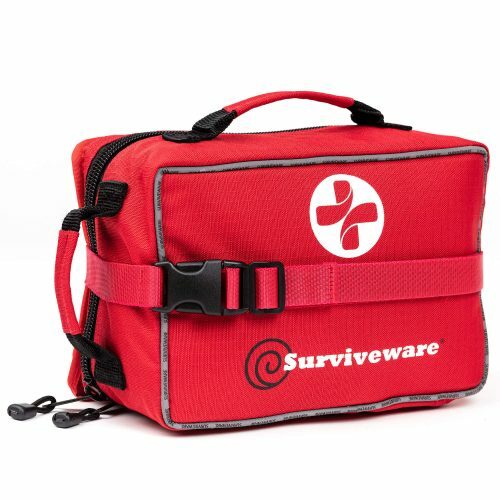 Get more value from your survival gear by purchasing Surviveware’s Large First Aid Kit. This product is available at an exclusive discount of 20% when you use Surviveware’s Amazon discount coupon. Buy it today by clicking here. Limited stocks are available.